Photo left - Your blogster, Gary Regester at the CES Las Vegas today with Oliver Yang, present owner of the TILTALL brand and manufacturer of the KINGHOME Tiltall iteration. Thanks to Bob Solomon, HP Marketing , I can now link the apostalic succession from the Brothers Marchioni to Oliver Yang, Taiwan. This story is not yet perfect - please join in. The Marchioni Bros sold to Leitz in 1974. And I believe relocated the factory. 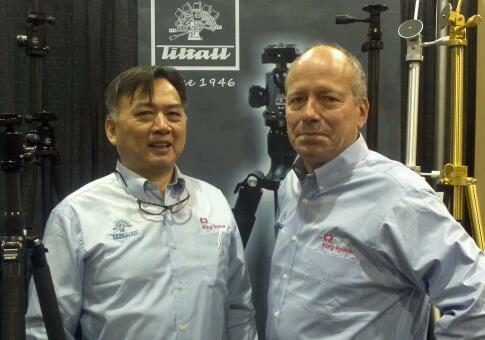 Some time in the early '80s Leitz sold the TILTALL brand to Fred Albu of Camera Barn in New York City. Fred added the Leitz iteration of TILTALL to the offerings of his import/export company, UNIFOT and split off a simplified version (no double threaded brass legs inserts) he named STAR D - puzzles remain (see next). After Fred's death, the Unifot executors sought to sell Tiltall (to among others, the Tiffen Company in Long Island.) Fred's West Coast manager together with Oliver Yang, who had already long been supplying Unifot with manufacturer goods from Taiwan, purchased the brand from Fred's estate and formed the company, Omicrom in San Fernando Valley, Los Angeles. Oliver's production followed the design changes made to the StarD variant. Oliver bought 100% ownership of the brand Tiltall in about 1995. There remains the mystery as to why the patent number and brand name "StarD" owned by the Davidson Optic Company in Los Angeles are featured in the literature of Fred's StarD NYC version? see several earlier blog entries on this StarD mystery or comment to solve the mystery. UPDATE after a second conversation with Bob Salomon two days later: Apparently, Mr. Albu sold the Davidson StarD tripods from from Los Angeles at his shop "Camera Barn" long before he purchased the TILTALL brand from Leitz. My surmise is that Davidson announced the end of their production and Fred purchased the name and patent near the time of his purchase of the TILTALL brand from Leitz - the rest of the TILTALL story would then fall into place. Fred has a son in the biz at Camera Barn named Henry who just might know the answer.